Apollo 11 astronaut Buzz Aldrin walking on the surface of the Moon, which consists of lunar regolith (photographed by Neil Armstrong, July 1969). A planetary surface is where the solid (or liquid) material of the outer crust on certain types of astronomical objects contacts the atmosphere or outer space. Planetary surfaces are found on solid objects of planetary mass, including terrestrial planets (including Earth), dwarf planets, natural satellites, planetesimals and many other small Solar System bodies (SSSBs). The study of planetary surfaces is a field of planetary geology known as surface geology, but also a focus of a number of fields including planetary cartography, topography, geomorphology, atmospheric sciences, and astronomy. Land (or ground) is the term given to non-liquid planetary surfaces. The term landing is used to describe the collision of an object with a planetary surface and is usually at a velocity in which the object can remain intact and remain attached. In differentiated bodies, the surface is where the crust meets the planetary boundary layer. Anything below this is regarded as being sub-surface or sub-marine. Most bodies more massive than super-Earths, including stars and gas giants, as well as smaller gas dwarfs, transition contiguously between phases, including gas, liquid, and solid. As such, they are generally regarded as lacking surfaces. Planetary surfaces and surface life are of particular interest to humans as it the primary habitat of the species, which has evolved to move over land and breathe air. Human space exploration and space colonization therefore focuses heavily on them. Humans have only directly explored the surface of Earth and the Moon. The vast distances and complexities of space makes direct exploration of even near-Earth objects dangerous and expensive. As such, all other exploration has been indirect via space probes. Indirect observations by flyby or orbit currently provide insufficient information to confirm the composition and properties of planetary surfaces. Much of what is known is from the use of techniques such as astronomical spectroscopy and sample return. Lander spacecraft have explored the surfaces of planets Mars and Venus. Mars is the only other planet to have had its surface explored by a mobile surface probe (rover). Titan is the only non-planetary object of planetary mass to have been explored by lander. Landers have explored several smaller bodies including 433 Eros (2001), 25143 Itokawa (2005), Tempel 1 (2005), and 67P/Churyumov–Gerasimenko(2014). Planetary surfaces are found throughout the Solar System, from the inner terrestrial planets, to the asteroid belt, the natural satellites of the gas giant planets and beyond to the Trans-Neptunian objects. Surface conditions, temperatures and terrain vary significantly due to a number of factors including Albedo often generated by the surfaces itself. Measures of surface conditions include surface area, surface gravity, surface temperature and surface pressure. Surface stability may be affected by erosion through Aeolian processes, hydrology, subduction, volcanism, sediment or seismic activity. 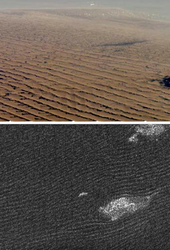 Some surfaces are dynamic while others remain unchanged for millions of years. Distance, gravity, atmospheric conditions (extremely low or extremely high atmospheric pressure) and unknown factors make exploration is both costly and risky. This necessitates the space probes for early exploration of planetary surfaces. Many probes are stationary have a limited study range and generally survive on extraterrestrial surfaces for a short period, however mobile probes (rovers) have surveyed larger surface areas. Sample return missions allow scientist to study extraterrestrial surface materials on Earth without having to send a manned mission, however is generally only feasible for objects with low gravity and atmosphere. The first extraterrestrial planetary surface to be explored was the lunar surface by Luna 2 in 1959. 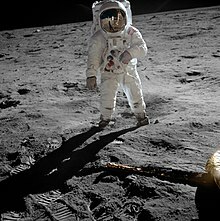 The first and only human exploration of an extraterrestrial surface was the Moon, the Apollo program included the first moonwalk on July 20, 1969 and successful return of extraterrestrial surface samples to Earth. Venera 7 was the first landing of a probe on another planet on December 15, 1970. Mars 3 "soft landed" and returned data from Mars on August 22, 1972, the first rover on Mars was Mars Pathfinder in 1997, the Mars Exploration Rover has been studying the surface of the red planet since 2004. NEAR Shoemaker was the first to soft land on an asteroid – 433 Eros in February 2001 while Hayabusa was the first to return samples from 25143 Itokawa on 13 June 2010. Huygens soft landed and returned data from Titan on January 14, 2005. There have been many failed attempts, more recently Fobos-Grunt, a sample return mission aimed at exploring the surface of Phobos. In May 2011, NASA announced the OSIRIS-REx sample return mission to asteroid 1999 RQ36, and is expected to launch in 2016. Other landing and sample return targets include 162173 Ryugu (Hayabusa 2 in 2018) and 101955 Bennu (OSIRIS-REx in 2020). Surface of comet Tempel 1 (photographed by the Deep Impact probe), consists of a fine powder of contains water and carbon dioxide rich clays, carbonates, sodium, and crystalline silicates. The most common planetary surface material in the Solar System appears to be water ice. Surface ice is found as close to the Sun as Mercury but is more abundant beyond Mars. Other surfaces include solid matter in combinations of rock, regolith and frozen chemical elements and chemical compounds. In general, ice predominates planetary surfaces beyond the frost line, while closer to the sun, rock and regolith predominate. Minerals and hydrates may also be present in smaller quantities on many planetary surfaces. Shoreline on Earth – land, sea, sand, and eroded clays. Earth's surface consists of a wide variety of water, carbon and silicon rich material. Surface liquid, while abundant on Earth (the largest body of surface liquid being the World Ocean) is rare elsewhere, a notable exception being Titan which has the largest known hydrocarbon lake system while surface water, abundant on Earth and essential to all known forms of life is thought only to exist as Seasonal flows on warm Martian slopes and in the habitable zones of other planetary systems. Volcanism can cause flows such as lava on the surface of geologically active bodies (the largest being the Amirani (volcano) flow on Io). Many of Earth's Igneous rocks are formed through processes rare elsewhere, such as the presence of volcanic magma and water. Surface mineral deposits such as olivine and hematite discovered on Mars by lunar rovers provide direct evidence of past stable water on the surface of Mars. Apart from water, many other abundant surface materials are unique to Earth in the Solar System as they are not only organic but have formed due to the presence of life – these include carbonate hardgrounds, limestone, vegetation and artificial structures although the latter is present due to probe exploration (see also List of artificial objects on extra-terrestrial surfaces). Increasingly organic compounds are being found on objects throughout the Solar System. While unlikely to indicate the presence of extraterrestrial life, all known life is based on these compounds. Complex carbon molecules may form through various complex chemical interactions or delivered through impacts with small solar system objects and can combine to form the "building blocks" of Carbon-based life. As organic compounds are often volatile, their persistence as a solid or liquid on a planetary surface is of scientific interest as it would indicate an intrinsic source (such as from the object's interior) or residue from larger quantities of organic material preserved through special circumstances over geological timescales, or an extrinsic source (such as from past or recent collision with other objects). Radiation makes the detection of organic matter difficult, making its detection on atmosphereless objects closer to the Sun extremely difficult. Martian exploration including samples taken by on the ground rovers and spectroscopy from orbiting satellites have revealed the presence of a number of complex organic molecules, some of which could be biosignatures in the search for life. The space probe Philae (spacecraft) discovered the following organic compounds on the surface of Comet 67P:. The following is a non-exhaustive list of surface materials that occur on more than one planetary surface along with their locations in order of distance from the Sun. Some have been detected by spectroscopy or direct imaging from orbit or flyby. Pluto's Tombaugh Regio (photographed by New Horizons flyby on July 14, 2015) appears to exhibit geomorphological features previously thought to be unique to Earth. Normally, gas giants are considered to not have a surface, although they might have a solid core of rock or various types of ice, or a liquid core of metallic hydrogen. However, the core, if it exists, does not include enough of the planet's mass to be actually considered a surface. Some scientists consider the point at which the atmospheric pressure is equal to 1 bar, equivalent to the atmospheric pressure at Earth’s surface, to be the surface of the planet. ^ Meyer, Charles; Treiman, Allanh; Kostiuk, Theodor (May 12–13, 1995). Meyer, Charles; Treiman, Allan H.; Kostiuk, Theodor (eds.). Planetary Surface Instruments Workshop (PDF). Houston, Texas. p. 3. Bibcode:1996psi..work.....M. Retrieved 2012-02-10. ^ "Planetary Surface materials". Haskin Research Group. Retrieved 2012-02-10. ^ Melosh, Jay (August 2007). Planetary Surface Processes. Cambridge Planetary Science. p. 9. ISBN 978-0-521-51418-7. ^ Ehrenfreund, P.; Spaans, M.; Holm, N. G. (2011). "The evolution of organic matter in space". Philosophical Transactions of the Royal Society A: Mathematical, Physical and Engineering Sciences. 369 (1936): 538–554. Bibcode:2011RSPTA.369..538E. doi:10.1098/rsta.2010.0231. PMID 21220279. ^ Anders, Edward (1989). "Pre-biotic organic matter from comets and asteroids". Nature. 342 (6247): 255–257. Bibcode:1989Natur.342..255A. doi:10.1038/342255a0. PMID 11536617. ^ Grundy, W. M.; Cruikshank, D. P.; Gladstone, G. R.; Howett, C. J. A.; Lauer, T. R.; Spencer, J. R.; Summers, M. E.; Buie, M. W.; Earle, A. M.; Ennico, K.; Parker, J. Wm. ; Porter, S. B.; Singer, K. N.; Stern, S. A.; Verbiscer, A. J.; Beyer, R. A.; Binzel, R. P.; Buratti, B. J.; Cook, J. C.; Dalle Ore, C. M.; Olkin, C. B.; Parker, A. H.; Protopapa, S.; Quirico, E.; Retherford, K. D.; Robbins, S. J.; Schmitt, B.; Stansberry, J. A.; Umurhan, O. M.; et al. (2016). "The formation of Charon's red poles from seasonally cold-trapped volatiles". Nature. 539 (7627): 65–68. Bibcode:2016Natur.539...65G. doi:10.1038/nature19340. PMID 27626378. ^ McCord, T.B. ; Hansen, G.B. ; Buratti, B.J. ; Clark, R.N. ; Cruikshank, D.P. ; D’Aversa, E.; Griffith, C.A. ; Baines, E.K.H. ; Brown, R.H.; Dalle Ore, C.M. ; Filacchione, G.; Formisano, V.; Hibbitts, C.A. ; Jaumann, R.; Lunine, J.I. ; Nelson, R.M. ; Sotin, C. (2006). "Composition of Titan's surface from Cassini VIMS". Planetary and Space Science. 54 (15): 1524–39. Bibcode:2006P&SS...54.1524T. doi:10.1016/j.pss.2006.06.007. ^ Grundy, W. M.; Buie, M. W.; Spencer, J. R. (October 2002). "Spectroscopy of Pluto and Triton at 3–4 Microns: Possible Evidence for Wide Distribution of Nonvolatile Solids". The Astronomical Journal. 124 (4): 2273–78. Bibcode:2002AJ....124.2273G. doi:10.1086/342933. ^ Barucci, M. A; Cruikshank, D. P; Dotto, E; Merlin, F; Poulet, F; Dalle Ore, C; Fornasier, S; De Bergh, C (2005). "Is Sedna another Triton?". Astronomy & Astrophysics. 439 (2): L1–L4. Bibcode:2005A&A...439L...1B. doi:10.1051/0004-6361:200500144. ^ Boehnhardt, H; et al. (2004). "Surface characterization of 28978 Ixion (2001 KX76)". Astronomy and Astrophysics Letters. 415 (2): L21–L25. Bibcode:2004A&A...415L..21B. doi:10.1051/0004-6361:20040005. ^ de Bergh, C. (2005). "The Surface of the Transneptunian Object 9048 Orcus". Astronomy & Astrophysics. 437 (3): 1115–20. Bibcode:2005A&A...437.1115D. doi:10.1051/0004-6361:20042533. ^ Omar, M.H. ; Dokoupil, Z. (May 1962). "Solubility of nitrogen and oxygen in liquid hydrogen at temperatures between 27 and 33°K". Physica. 28 (5): 461–471. Bibcode:1962Phy....28..461O. doi:10.1016/0031-8914(62)90033-2. ^ Rivkin, Andrew S.; Emery, Joshua P. (2010). "Detection of ice and organics on an asteroidal surface". Nature. 464 (7293): 1322–1323. Bibcode:2010Natur.464.1322R. doi:10.1038/nature09028. PMID 20428165. (pdf version accessed 28 Feb. 2018). ^ Voosen, Paul (2018). "NASA rover hits organic pay dirt on Mars". Science. doi:10.1126/science.aau3992. ^ Eigenbrode, Jennifer L.; Summons, Roger E.; Steele, Andrew; Freissinet, Caroline; Millan, Maëva; Navarro-González, Rafael; Sutter, Brad; McAdam, Amy C.; Franz, Heather B.; Glavin, Daniel P.; Archer, Paul D.; Mahaffy, Paul R.; Conrad, Pamela G.; Hurowitz, Joel A.; Grotzinger, John P.; Gupta, Sanjeev; Ming, Doug W.; Sumner, Dawn Y.; Szopa, Cyril; Malespin, Charles; Buch, Arnaud; Coll, Patrice (2018). "Organic matter preserved in 3-billion-year-old mudstones at Gale crater, Mars". Science. 360 (6393): 1096–1101. Bibcode:2018Sci...360.1096E. doi:10.1126/science.aas9185. PMID 29880683. ^ Vu, Tuan H; Hodyss, Robert; Johnson, Paul V; Choukroun, Mathieu (2017). "Preferential formation of sodium salts from frozen sodium-ammonium-chloride-carbonate brines – Implications for Ceres' bright spots". Planetary and Space Science. 141: 73–77. Bibcode:2017P&SS..141...73V. doi:10.1016/j.pss.2017.04.014. ^ McCord, Thomas B; Zambon, Francesca (2018). "The surface composition of Ceres from the Dawn mission". Icarus. doi:10.1016/j.icarus.2018.03.004. ^ De Sanctis, M. C.; Ammannito, E.; McSween, H. Y.; Raponi, A.; Marchi, S.; Capaccioni, F.; Capria, M. T.; Carrozzo, F. G.; Ciarniello, M.; Fonte, S.; Formisano, M.; Frigeri, A.; Giardino, M.; Longobardo, A.; Magni, G.; McFadden, L. A.; Palomba, E.; Pieters, C. M.; Tosi, F.; Zambon, F.; Raymond, C. A.; Russell, C. T. (2017). "Localized aliphatic organic material on the surface of Ceres". Science. 355 (6326): 719–722. Bibcode:2017Sci...355..719D. doi:10.1126/science.aaj2305. PMID 28209893. ^ Williams, David R. (10 December 2012). "Ice on the Moon". NASA. ^ Moskowitz, Clara (2010-04-28). "Water Ice Discovered on Asteroid for First Time". Space.com. Retrieved 2018-08-20. ^ "Europa: Another Water World?". Project Galileo: Moons and Rings of Jupiter. NASA, Jet Propulsion Laboratory. 2001. Archived from the original on 21 July 2011. Retrieved 9 August 2007. ^ McKinnon, William B.; Kirk, Randolph L. (2007). "Triton". In Lucy Ann Adams McFadden; Lucy-Ann Adams; Paul Robert Weissman; Torrence V. Johnson (eds.). Encyclopedia of the Solar System (2nd ed.). Amsterdam; Boston: Academic Press. pp. 483–502. ISBN 978-0-12-088589-3. ^ Langevin, Y (1997). "The regolith of Mercury: present knowledge and implications for the Mercury Orbiter mission". Planetary and Space Science. 45 (1): 31–37. Bibcode:1997P&SS...45...31L. doi:10.1016/s0032-0633(96)00098-0. ^ Scott, Keith; Pain, Colin (18 August 2009). Regolith Science. Csiro Publishing. pp. 390–. ISBN 978-0-643-09996-8. ^ "Flowing nitrogen ice glaciers seen on surface of Pluto after New Horizons flyby". ABC. 25 July 2015. Retrieved 6 October 2015. ^ McKinnon, William B.; Kirk, Randolph L. (2014). "Triton". In Spohn, Tilman; Breuer, Doris; Johnson, Torrence (eds.). Encyclopedia of the Solar System (3rd ed.). Amsterdam; Boston: Elsevier. pp. 861–82. ISBN 978-0-12-416034-7. ^ Yang, Bin; Lucey, Paul; Glotch, Timothy (2013). "Are large Trojan asteroids salty? An observational, theoretical, and experimental study". Icarus. 223 (1): 359–366. arXiv:1211.3099. Bibcode:2013Icar..223..359Y. CiteSeerX 10.1.1.763.9669. doi:10.1016/j.icarus.2012.11.025. ^ Deziel, Chris (April 25, 2017). "Salt on Other Planets". Sciencing. ^ Rivkin, A.S; Volquardsen, E.L; Clark, B.E (2006). "The surface composition of Ceres: Discovery of carbonates and iron-rich clays" (PDF). Icarus. 185 (2): 563–567. Bibcode:2006Icar..185..563R. doi:10.1016/j.icarus.2006.08.022. ^ Napier, W.M. ; Wickramasinghe, J.T. ; Wickramasinghe, N.C. (2007). "The origin of life in comets". International Journal of Astrobiology. 6 (4): 321. Bibcode:2007IJAsB...6..321N. doi:10.1017/S1473550407003941. ^ "Clay-Like Minerals Found on Icy Crust of Europa". JPL, NASA.gov. December 11, 2013. ^ Boynton, WV; Ming, DW; Kounaves, SP; et al. (2009). "Evidence for Calcium Carbonate at the Mars Phoenix Landing Site" (PDF). Science. 325 (5936): 61–64. Bibcode:2009Sci...325...61B. doi:10.1126/science.1172768. PMID 19574384. ^ Clark, B. C; Arvidson, R. E; Gellert, R; et al. (2007). "Evidence for montmorillonite or its compositional equivalent in Columbia Hills, Mars" (PDF). Journal of Geophysical Research. 112 (E6): E06S01. Bibcode:2007JGRE..112.6S01C. doi:10.1029/2006JE002756. ^ Landau, Elizabeth; Greicius, Tony (29 June 2016). "Recent Hydrothermal Activity May Explain Ceres' Brightest Area". NASA. Retrieved 30 June 2016. ^ Lewin, Sarah (29 June 2016). "Mistaken Identity: Ceres Mysterious Bright Spots Aren't Epsom Salt After All". Space.com. Retrieved 2016-06-30. ^ De Sanctis, M. C.; et al. (29 June 2016). "Bright carbonate deposits as evidence of aqueous alteration on (1) Ceres". Nature. 536 (7614): 54–57. Bibcode:2016Natur.536...54D. doi:10.1038/nature18290. PMID 27362221. Retrieved 2016-06-30. ^ Kounaves, S. P.; et al. (2014). "Evidence of martian perchlorate, chlorate, and nitrate in Mars meteorite EETA79001: implications for oxidants and organics". Icarus. 229: 169. Bibcode:2014Icar..229..206K. doi:10.1016/j.icarus.2013.11.012. ^ a b c Grundy, W. M.; Young, L. A.; Spencer, J. R.; Johnson, R. E.; Young, E. F.; Buie, M. W. (October 2006). "Distributions of H2O and CO2 ices on Ariel, Umbriel, Titania, and Oberon from IRTF/SpeX observations". Icarus. 184 (2): 543–555. arXiv:0704.1525. Bibcode:2006Icar..184..543G. doi:10.1016/j.icarus.2006.04.016. ^ a b Jones, Brant M.; Kaiser, Ralf I.; Strazzulla, Giovanni (2014). "Carbonic acid as a reserve of carbon dioxide on icy moons: The formation of carbon dioxide (CO2) in a polar environment". The Astrophysical Journal. 788 (2): 170. Bibcode:2014ApJ...788..170J. doi:10.1088/0004-637X/788/2/170. ^ Lellouch, E.; de Bergh, C.; Sicardy, B.; Ferron, S.; Käufl, H.-U. (2010). "Detection of CO in Triton's atmosphere and the nature of surface-atmosphere interactions". Astronomy and Astrophysics. 512: L8. arXiv:1003.2866. Bibcode:2010A&A...512L...8L. doi:10.1051/0004-6361/201014339. ^ Gipson, Lillian (24 July 2015). "New Horizons Discovers Flowing Ices on Pluto". NASA. Retrieved 24 July 2015.